BOB Financial Solutions Limited Recruitment 2019 - Job notification for AVP Post – IT Security in BOB Financial Solutions Limited, Mumbai, Maharashtra. Applications are invited by BOB Financial Solutions Limited (BFSL - formerly BOBCARDS Limited) on or before 20 Feb 2019 for 1 vacancy. B.E/B.Tech in Computer science/Information Technology from Reputed Colleague/University. This level of seniority usually demands around a decade of proven IT security experience. Change management and business process experience together with a proven track record of driving large-scale change programs will be an advantage. Preferred Training, Certifications and/or Other Special Requirements: CISSP (Certified Information Systems Security Professional) Certification. Compensation will not be a limiting factor for the right candidate and will be discussed on a case by case basis. On the basis of Interview. Eligible candidates may Email to careers@bobfinancial.com with the subject as “AVP – IT Security” on or before 20 Feb 2019. BOB Financial Solutions Limited Recruitment 2019 - Job notification for Area Sales Manager Post in BOB Financial Solutions Limited, Mumbai, Maharashtra, Delhi, Banglaore, Karnataka, Kolkata, West Bengal, Jaipur, Rajasthan. Applications are invited by BOB Financial Solutions Limited (BFSL - formerly BOBCARDS Limited) on or before 07 May 2019 for 1 vacancy. 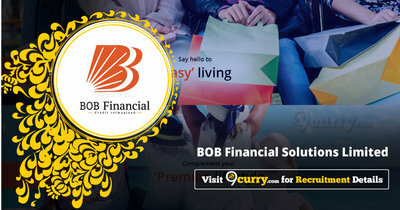 BOB Financial Solutions Limited Recruitment 2019 - Job notification for Regional Sales Manager Post in BOB Financial Solutions Limited, Mumbai, Maharashtra, Delhi, Banglaore, Karnataka, Kolkata, West Bengal. Applications are invited by BOB Financial Solutions Limited (BFSL - formerly BOBCARDS Limited) on or before 07 May 2019 for 1 vacancy. BOB Financial Solutions Limited Recruitment 2019 - Job notification for Zonal Sales Manager Post in BOB Financial Solutions Limited, Mumbai, Maharashtra. Applications are invited by BOB Financial Solutions Limited (BFSL - formerly BOBCARDS Limited) on or before 07 May 2019 for 1 vacancy. BOB Financial Solutions Limited Recruitment 2019 - Job notification for Manager / Assistant Manager Post – Regional Alliances in BOB Financial Solutions Limited, Mumbai, Maharashtra, Kolkata, West Bengal, Ahmedabad, Gujarat. Applications are invited by BOB Financial Solutions Limited (BFSL - formerly BOBCARDS Limited) on or before 07 May 2019 for 1 vacancy. BOB Financial Solutions Limited Recruitment 2019 - Job notification for Sr. Officer / Officer Post - Credit Underwriter – Credit Cards in BOB Financial Solutions Limited, Mumbai, Maharashtra. Applications are invited by BOB Financial Solutions Limited (BFSL - formerly BOBCARDS Limited) on or before 07 May 2019 for 1 vacancy.